"This is so easy and great for parties!" Mix the egg, garlic, and feta in a large bowl. Stir in the spinach. 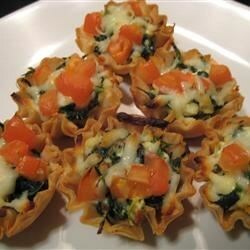 Place the phyllo shells on flat baking sheets, and fill with the spinach mixture. Bake in preheated oven until hot, 6 to 8 minutes. These were good but everyone thought they needed more sauce. I would add a little mayo to moisten them.